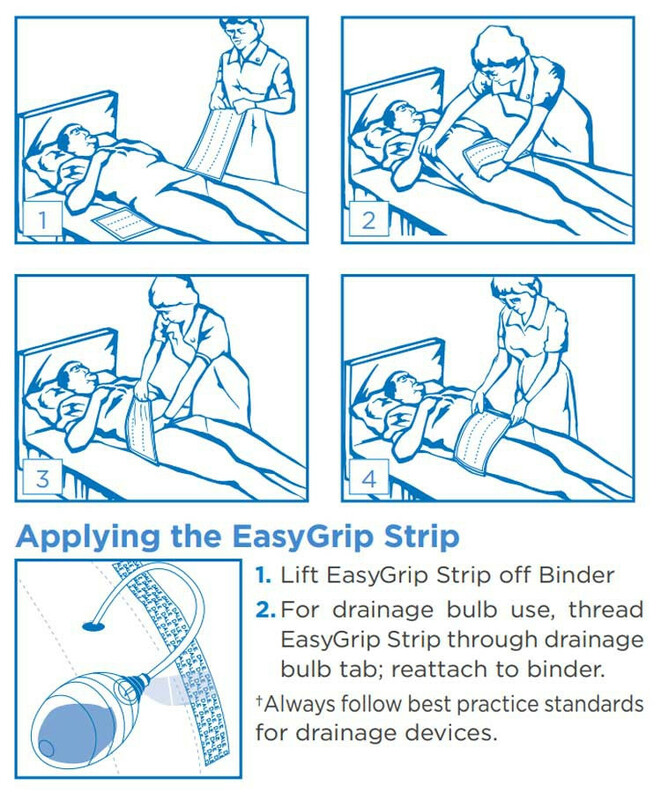 Dale­® Abdominal Binders with EasyGrip&0153; Strip are the only binders that have been clinically shown to expedite the return of pulmonary function after open abdominal surgery while encouraging patients to ambulate sooner. 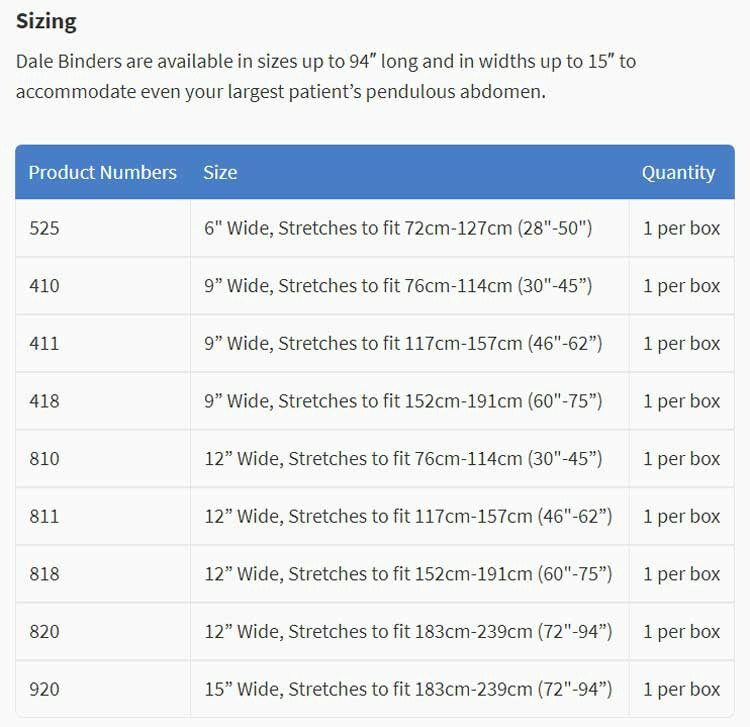 Dale­® Binders are available in sizes up to 94" long and in widths up to 15" to accommodate even your largest patient's pendulous abdomen. The Dale­® Binder is made entirely of an exclusive stretch material that provides full, all-around compression and perfect sizing. 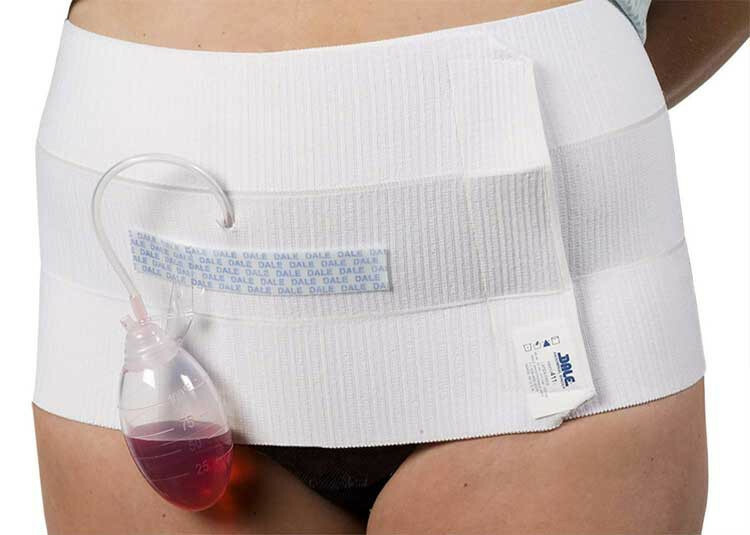 The newest model Dale­® Abdominal Binder now features the new EasyGrip T Strip which can hold up to four 100cc drainage bulbs in place. This new feature allows for easier monitoring of drainage bulb contents and drainage bulbs to be emptied or removed quickly without the hassle of removing pins or tape. It also allows for easier ambulation when drainage bulbs are in place. 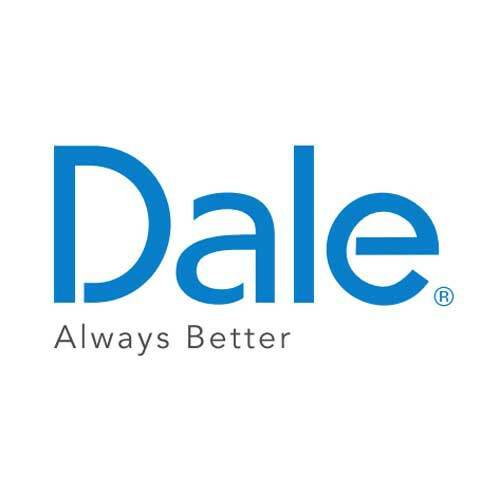 Unlike other binders, which can restrict movement, Dale® Binders actually promote mobility and lessen the chance of sedentary complications. 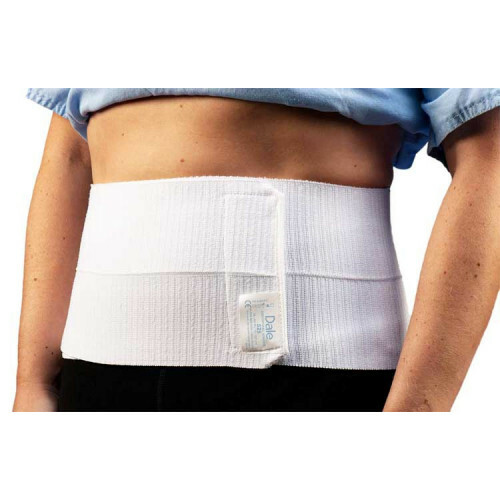 The two panel Abdominal Binders can also be used as rib belts. 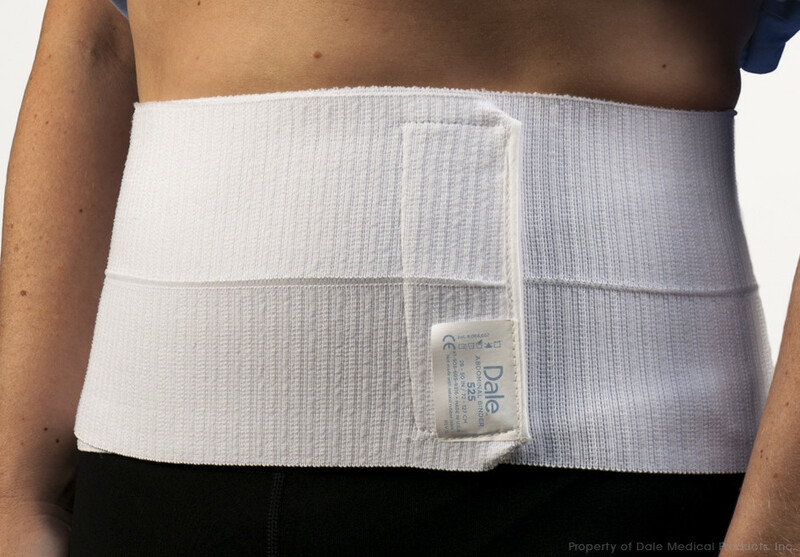 To apply the Dale Abdominal Binder, position the binder under the patient with the soft lining against the skin. The velcro fastener on the patient's right and the seam at the center of the patient's back. Make sure that the lower edge crosses halfway down the buttocks and is low on the patient's pelvic area. Using the patient's weight as anchor stretch out the end of the binder which is on the patient's left and hold it in position across the stomach with one hand. With your other hand, grasp the other end of the binder in the middle. Stretch it upward over the patient's body and firmly engage the velcro surfaces. To adjust the fit, simply peel the surfaces apart and reposition them. The closure can be diagonally angled to confirm to any patient's body shape. It's important to correctly and adequately stretch the binder. Remember, it won't restrict breathing. To the contrary, it's the stretching and compression which facilitates deep breathing. 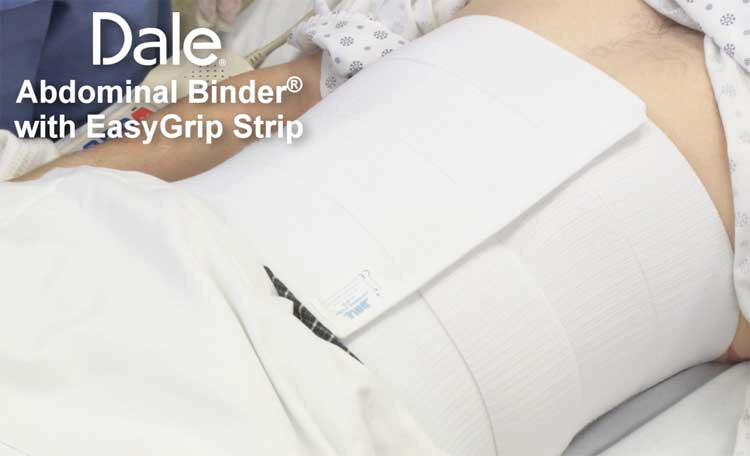 The Dale Abdominal Binder is ideal for holding wound dressings and accommodates the use of surgical tools as well as Jejunostomy, Chest Drainage Tubes and G-Tubes. 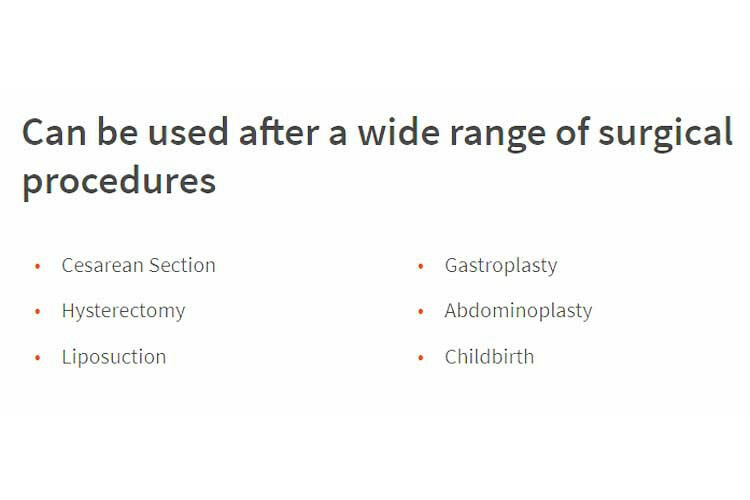 Prior to applying the binder, surgical sponges or ABD pads should be placed on both sides of the drain to prevent excessive pressure on or occlusion of the drainage tube. If Open-System Penrose type drains are used, holes should be cut to accommodate the tubes. Begin by resting the binder over the drainage site. Be sure that the material is laying flat and that it's not doubled over. Mark the fabric vertically where the hole will be made. Crease the fabric and make a very narrow elliptical cut in the material. When the fabric is stretched the cut will become a round hole. Cut away any loose fibers from the fabric around the area of the hole. The binder will not unravel and will retain its properties for providing support and compression even if the cut crosses the gap free stitching that joins the panels. 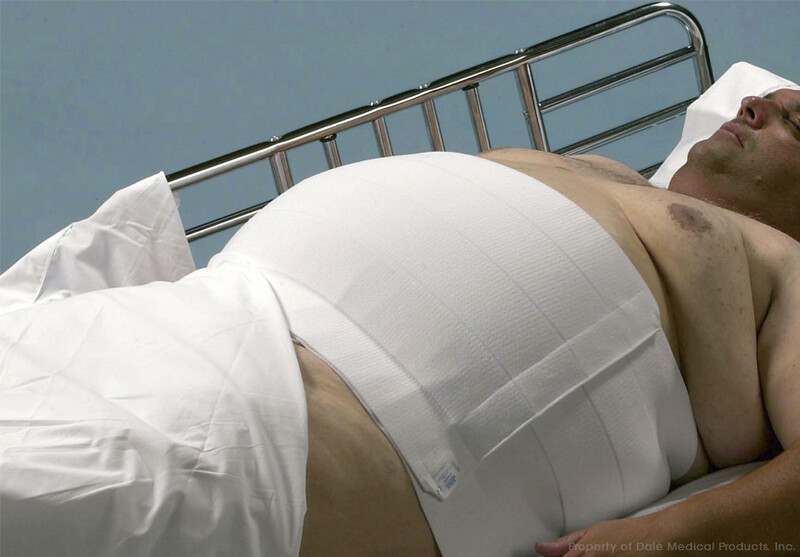 Once the patient becomes ambulatory, the binder may be applied while he or she is standing. To do this, the patient or the nurse should position the top edge of the binder just below the navel with the soft lining against the skin. then stretch both ends out sideways. Wrap one end around and then the other. Finally, press fasten the continuous velcro closure and position the binder for an ideal fit. Patients may take their Dale Binders home for continued benefits both during and after recovery. 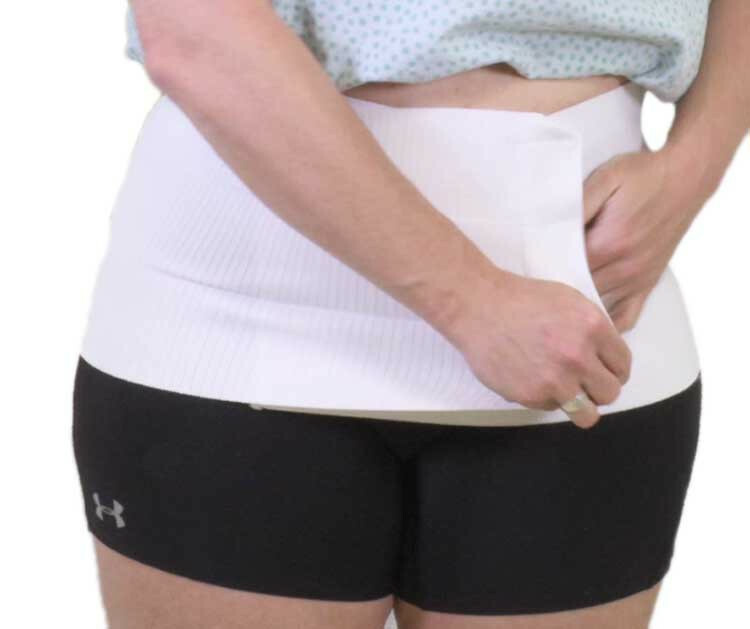 It fits inconspicuously under clothing to provide comfortable support as normal activity resumes. The binder may be gently washed by hand or machine with a mild detergent and air dried. But be sure to engage the velcro surfaces completely before laundering. 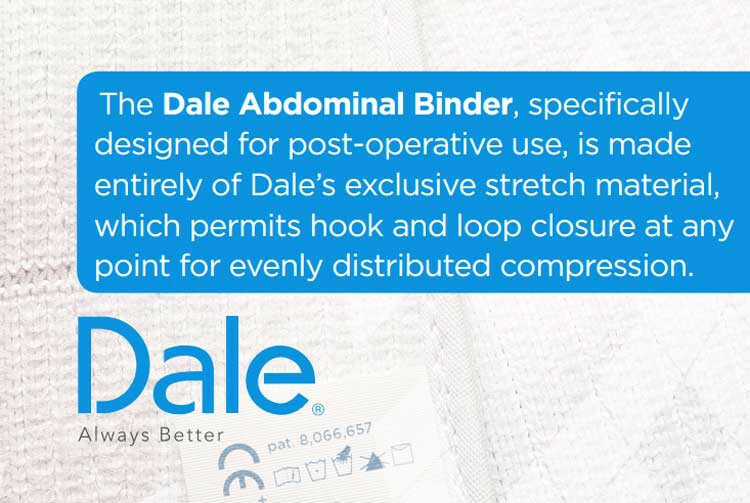 With so many applications and so many benefits both medical and economical, Dale Abdominal Binders are the obvious choice for hospitals and health care providers that want to take hold of patient care. 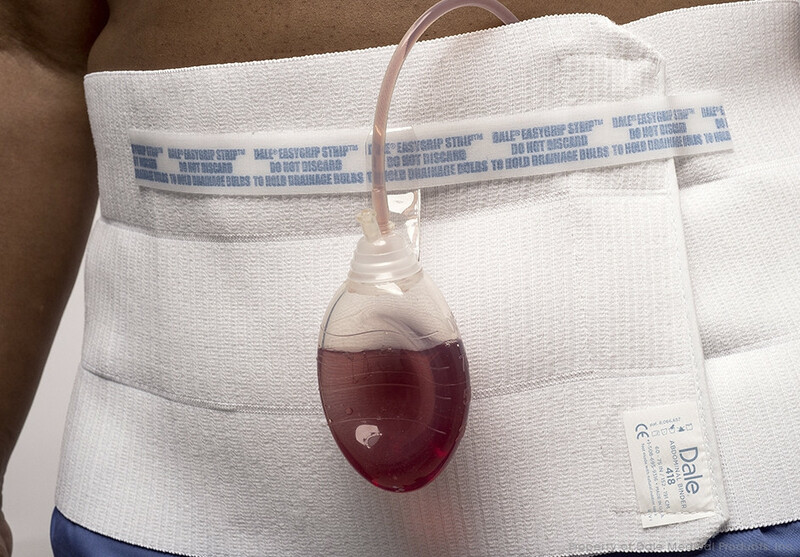 Binder Fact Sheet offers features and benefits of this securement and support device. Clinical Advantages provides information about the benefits of the product. Product Instructions offers information about use with drainage tubes. Application Instructions covers how to properly don the product. This product looks wonderful. Does it contain polyester or latex? I react badly to both of those materials. Many thanks. This item does NOT contain latex but is made of polyester material. Is the abdominal binder 818 latex free? I need to wear abdominal binders!! Where I use to purchase them the latest price increase was unreasonable. After searching the web, I found this site and the binders were at a reasonable price. I ordered them on a weekend and received them by Wednesday. They actually arrived the day I received my tracking notice!!! I will return to this site for other products!!! Fast wonderful service. Excellent products! I wore it daytime after my abdominoplasty. Washed nicely' air dried overnight. Feel more comfort with this binder! You may have no idea how humiliating it is to show your leaking urine in public. I know because I have experienced it. My daughter got this for me after she heard the story and it is just great. 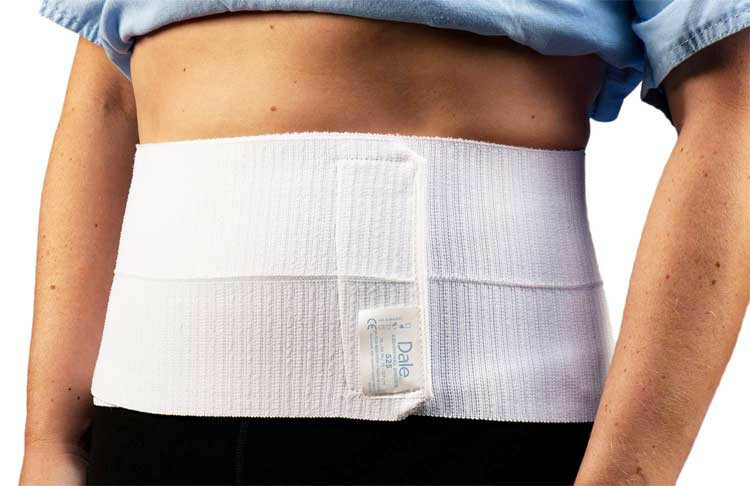 It is so stretchy that even I can wear and stays in shape all day long despite movement.